Sasaki Time: Giveaway: Playstation 4 System! 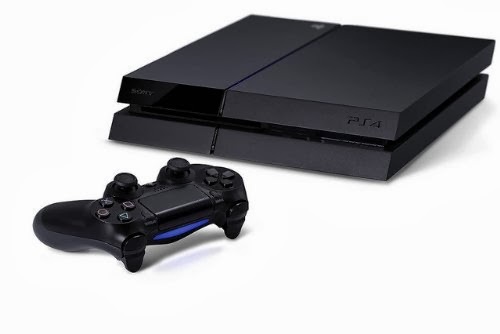 Enter to win the brand new Playstation 4 video game system! This would be an awesome gift for my Hubz. This would be a gift for the kiddo. This would be a gift for my brother for doing so much for me. It would be for me. I've never own a game system and my DVD player has been broken for many years. It would be nice to have it. OMG!! This will be for my Hubby and kids!!! This would be a gift for my two sons, 12 and 17. Boy would they LOVE to find this under the tree. Because I definitely need to replace my Wii with something else. And also OCTODAD! Hubby! And me, by proxy. It would be for my husband and boys. My family. we would never afford one because of the price. My husband because we could never afford it our selves and he works so hard for us that I would love to be able to gift this to him. This would be for my children :) They would absolutely love it. This would be a gift for my hardworking husband!! He deserves some "me" time and he would absolutely love it!! For my husband and child. This gift would be for my husband. He would be fully stoked!! I know this is the only way he will get one because he would never spend that much money on his self. This would be for my son & husband! This would definitely be for my husband! This would be for the family. Man, do we miss our PS3!! It would be for our family. We do not have a gaming system. We had a Wii but it stopped working last year. This would be the star gift for my teen daughter! I definitely want to keep this for myself. It would be a gift for my grandkids. It would be a gift for my husband ! For my husband! our PS 3 just broke! This gift would be for my 11yr old!! He would absolutely love this!! This would be a gift for my son Aidan. This would be a gift for my fiance! Thank you for the awesome giveaways! This would be the greatest gift for the whole family, even the extended ones that are always here as well. This would be for me, of course, but I would share it by putting in in the living room! This would be a gift for my son. It would be nice to make his Christmas amazing. I'd definitely give it to my husband. For my husband! Fingers crossed! It would be a gift for my husband...and also for me. I would use it for our family. I live with my daughter and her children and this would be great to have. It would be a gift for my Dad. This would be a gift for the whole family. This would be a dream come true for my kids!! This would be an awesome gift for my husband and son! ME, ME, ME. My wife and daughter don't have quite the appreciation(wink, wink) for video games as I do!!! A gift - I know two kids who would love this. This would be for my children. They would so love this. Thanks for the opportunity. not sure! would have to ask hubby if he wanted "dibs"! I would wrap this up for the whole family from "Santa"
A gift for the whole family, we love to play games together. It would be mine, my own....my precious! It would be a gift for my nephews! I could not imagine the joy this would give my guys. this would be for my sons...id prob see my husband on it too!! For my son he would flip out! My hubby would be so excited! This would be for my Boys they both have Birthdays the 19th and 29th of December and with Christmas this would be perfect! My husband was recently hurt and has been out of work!! Good luck to all and Thank you for such a wonderful Giveaway to brighten up someone's holiday! It would be for the whole family. Myself, my hubby and the kids all play. A child at my children's school. I would really love to win this for my husband! ! This gift would be for my boyfriend who still has a ps2 and badly wants a new gaming system but just can't afford it. Thanks for the opportunity to win, happy holidays! I would love to win this for my godson and myself! His mother wants to get him a PS4, but is unable to afford one (would keep at my house since he comes over all the time). Merry Christmas! This would be a gift for my kids. This would go to my 6 grandchildren in Ca. The little Army brats need something to keep them happy since maw maw lives in Ohio. This would be a gift for my niece Chloe Monet Cannella! This would make an amazing gift for my boyfriend.. Seeing how I cant afford to get him anything this year. This would go to my kids, ages 13,11 and 8. It would be for my son, he would flip! For my kids. My 10 year old has asked for one but there is just no way I can swing it this year. I have no doubt the others (8,6 & 6) would love it too. This would be a gift for my husband and son. I would be for me son! This would be for my stepson, and he would totally Freak OUT to find this under the tree! Would be a gift for my husband and daughter. They are playing on a Playstation, no number after it, a Playstation. This would be great! would be for my hubby! This would be a gift for my husband and four children! It would be a perfect gift for me. I would give this to my husband. He always gets mad when I spend money on him! LOL! My son has this on his Christmas list. I would love to be able to give it to him! This would be for my son, but I might play it too. Thanks for a great giveaway! This would be a gift for my two children who have only had a Wii since forever. This would be for someone else, a good friend. I would give this to my son, his birthday is on New Years day. He would be so excited to get this! It would be our family Christmas gift!!! For someone else...as a great Christmas gift.. Hate to say, but... I'd have to keep this! Shhhh! LOL gift for daughter and her fiancee' - they would love one. Wish I could give them one. Thanks for the chance and Good Luck to All! I might have to keep this one! I would use it as a gift for someone else. Thanks. this would be for my little girl! thanks for the chance...Merry Christmas! would be for my son!! This would be for hubby and my son, if they can get it away from my daughter. This would be a great Christmas surprise for my son! This would be a gift for my husband and kids! I'd keep this all to myself. this would be a gift for my family. i can not tell a lie it would probably be for me if i won!